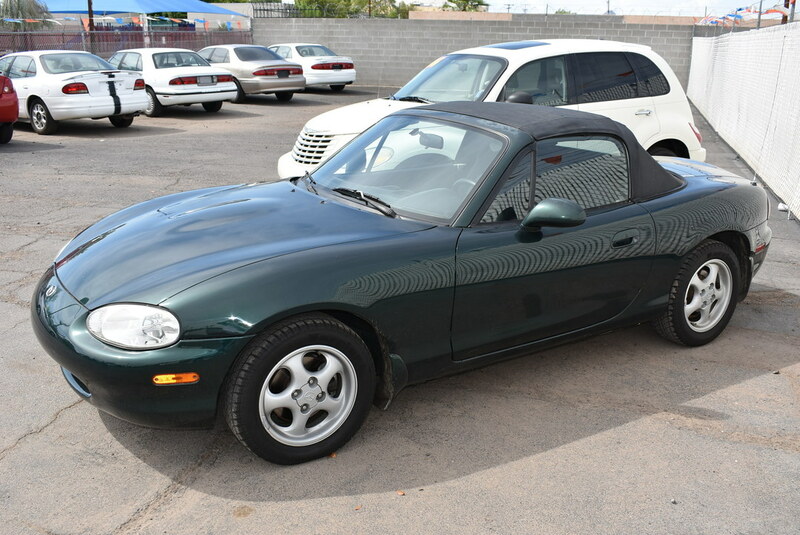 Our 1999 Mazda MX-5 Miata offers truly outstanding, classic sports car handling. There's plenty of power for this lightweight rear-wheel-drive roadster with the 1.8L 4 Cylinder. This car is designed for driving fun, not mere transportation. The destination is unimportant; getting there is everything. This car only seats two. Perfect, right?? Inside the cockpit, the leather bucket seats are comfortable and supportive. The trunk is big enough to wedge in a couple of golf bags or enough luggage for a long weekend. Chic and memorable! In terms of an affordable roadster our Miata is near perfection. Print this page and call us Now... We Know You Will Enjoy Your Test Drive Towards Ownership! CARFAX 1 owner! This car has spent it's whole life here in rust free Arizona! Great fuel economy and fun at the same time!